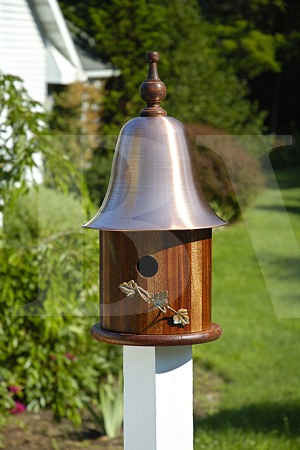 Heartwood Ivy House Bird House-MADE IN THE USA BIRDHOUSE! I hope you love birds, too, great American poet Emily Dickinson once said. It is economical. It saves going to heaven. Emily would have loved the little piece of heaven that is The Ivy House. Spun copper roof topped with a wooden finial; solid cypress body painted cheerful bright white, or you can get it in solid mahogany, with a hand-made copper climbing ivy vine for a perch that will yield happy new verses in bird song. Roof removes for easy cleanout. Mounting bracket and screws included--poetic license comes with repeated bird viewing!